Sika Scofield | Salmon Bay Sand & Gravel Co.
Scofield, a Sika Company, is the world’s leading manufacturer of decorative concrete coloring, texturing, sealing and performance systems. Scofield’s Cementone, Cureseal and Selectseal products are widely recognized in the concrete industry for their quality and performance. Salmon Bay is a proud distributor of Scofield and Sika construction products. CEMENTONE Clear Concrete Sealer produces a low-maintenance film that can improve resistance to deicing salts, many chemicals, weather, and ultraviolet (UV) radiation. It reduces surface staining from incidental contact with materials such as automotive oil, grease, and food spills. 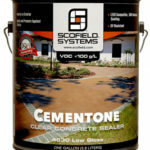 Cementone protects multicolored, colored or uncolored concrete and cementitious toppings. SCOFIELD Cureseal-S is a clear solvent based curing and sealing material developed for use on interior and exterior concrete. Cureseal-S is available in a gloss or matte finish and will darken the color of colored concrete surfaces. It may be used to protect horizontal or vertical quarry tile, brick, block, stone, exposed aggregate or cementitious surfaces. 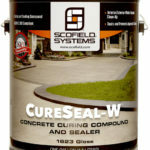 SCOFIELD Cureseal-W is a clear water-based concrete curing compound and sealer developed for use on interior and exterior colored or uncolored concrete. Cureseal-W will provide minimal alteration to color. It is a medium-duty sealer with a low-gloss finish. SCOFIELD® SelectSeal Plus™ is a waterborne concrete sealer which produces a gloss that is comparable to most solvent-based sealers. It does this with low odor, so you can use it on the interiors of most buildings. 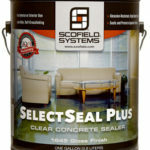 Selectseal Plus utilizes a unique proprietary technology that provides superior wet slip resistance while forming a tough stain and abrasion resistant finish that is superior to most solvent-based sealers.